This Aluminium Range of Attic stairs are designed for heavy use in commmercial and industrial applications. 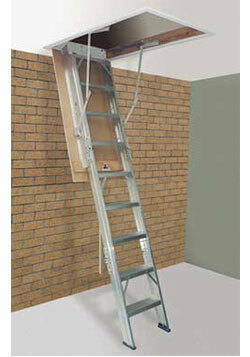 These strong attic ladders are constructed of quality heavy duty aluminium sections with deep 100mm wide ladder treads. Ullrich attic ladders are specially designed with unique extra strong hinges that take the loads found in heavy commmercial and industrial useage. A simple height adjustment means these attic stairs can fit your location without having to cut the aluminium in most situations. The aluminium range of Attic Stairs are guaranteed for 5 years for commercial applications.